I have just finished reading Simon Thurley's Men from the Ministry: How Britain saved its heritage (Yale University Press, 2013) [Amazon]. Thurley, the Head of English Heritage, is passionate about his subject. This is like reading a biography of buildings, monuments and locations that I have known for decades: from the Neolithic flint mines at Grime's Graves in Norfolk, to east Anglian windmills; from medieval castles to Victorian coastal defences. Although the subtitle includes 'Britain' the focus of the study is England. However Tintern Abbey and Beaumaris Castle (both in Wales) get honourable mentions, as does Edinburgh Castle. The book explains how specific monuments came to be protected and the rationale for including (or excluding) areas around them. It is striking how the impact of earlier recessions had an impact on what was saved (and lost). The book explains the changing bodies such as the Ministry of Public Buildings and Works (MPBW), the Department of the Environment, and then English Heritage. There is a discussion of the distinctive 'guardian' huts, the introduction of the lawnmower, as well as the creation of that distinctive signage. Thurley explains guardianship responsibilities of other bodies such as the National Trust. 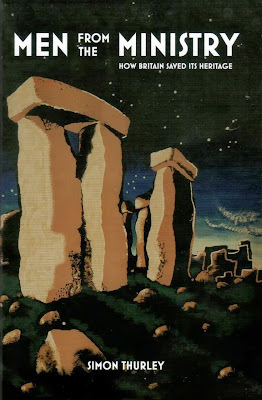 There are chapters dedicated to Stonehenge and to the saving of Hadrian's Wall. The final chapter is provocative, not least in the present economic climate. Thurley compares spending on heritage per head of population in 2011: Scotland (£10), Wales (£5.50) and England (£2). He notes the money spent on 'saving' three pictures - £34.88 million, and £95 million - and wonders if such a strategy is sustainable.